grandma's cookie jar: Cookie Service Project & Cookie Recipe Contest - You Still Have Time to Enter! Cookie Service Project & Cookie Recipe Contest - You Still Have Time to Enter! 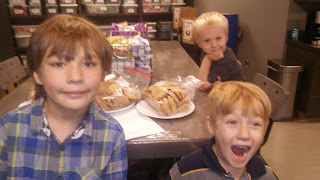 Yesterday my grandsons and I made 118 cookies - yes, 118! They made the cookies to take to church and leave in the volunteer's lounge as a thank you for them! We made oatmeal cookies (thank you Jennifer McLeod as they are probably the best oatmeal cookies I've ever had! ), Toll House and Cinnamon-Brown Sugar-Butter cookies . . . giving the volunteers a variety from which to choose! I want my grandsons to learn to be thankful people, so baking and taking cookies to the volunteers seemed like a fun project for them to work on - and one sure to be enjoyed by those who ate the cookies! By the way, since I announced the cookie recipe contest four days ago, only two of you have shared recipes. The prize - a photo cookie jar - is a fun, and appropriate prize and someone will win it! Please take a minute to share your favorite cookie recipe . . . you have ten more days until the contest ends! You'll find all the details at this link.